Abu Dhabi based Etihad Airways said the number of passengers traveling with them increased 9% to 616,000 in July compared to the same period last year. This make July 2009 the busiest month in the airline’s history. 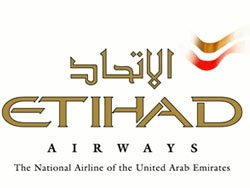 Etihad Airways flights were 88% full and weekly flights increased 20%. Chief Executive James Hogan said “We now look forward to building upon this for the remainder of the summer holiday period and into the Holy Month of Ramadan.” New service to Athens, Istanbul, and Larnaca in Cyprus contributed to the higher number of passengers in July.